Ya know.....I love meeting like this every Friday. Don't you? We have this little date, and I know there are those of you living outside of the United States that drop in for a visit, too, and that just makes me smile. Thank you! This is your next task in our little Tucker journey. Sew six rows of eight 1 1/2 inch squares together (48 squares). All dark squares. Your block should measure 6 1/2 by 8 1/2 unfinished. That's it! I know...not all that exciting a block is it? Well....it has an important job. All will be revealed next Friday! I can wait to share this with you. Hope you have a wonderful weekend enjoying Halloween, and gain one hour of sleep as we turn our clocks back. I really like that better then jumping ahead, although I never actually sleep the extra hour! Have fun.....and thanks for sewing along with me. I'm always so very glad you did! Hooray!! The day has finally come where I can tell you about an exciting, new fabric series I've been working on for Marcus Fabrics!! It's called Antique Cotton Calicos! 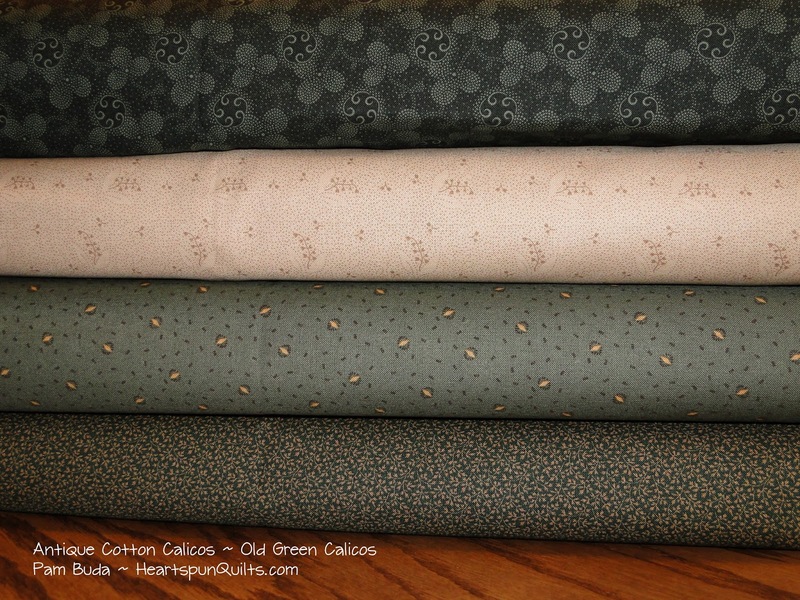 This lovely print is one of many in this first collection released under the series name, and the collection is called Old Green Calicos. With the word ~ Green ~ in the name, it's no surprise there are lovely green prints. But, that's not all! We have to have some lights in there, right? And....I couldn't resist pairing the selection of greens with some blues. And...one of my favorite things to do is to create multi-color light prints! Love, love! Ugh...I forgot to use the flash on this picture so this warm, beige print looks very yellow in this picture, but it's not! Trust me! It's the same tones I'm known for, and it's sooo cute! 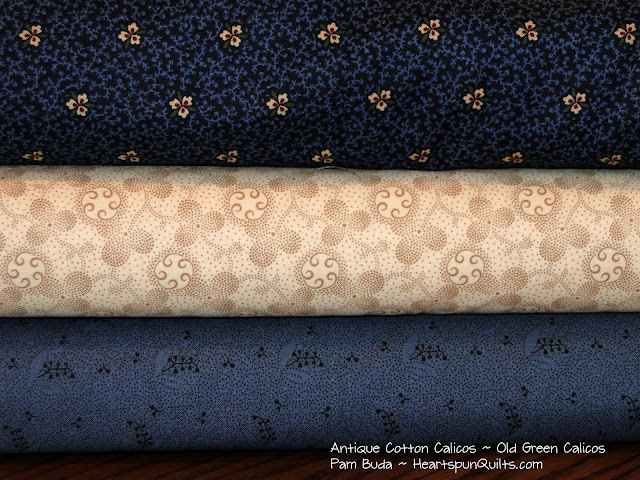 I hope you like what you see in this first collection of Antique Cotton Calicos. I promise more collections in the series are coming soon. 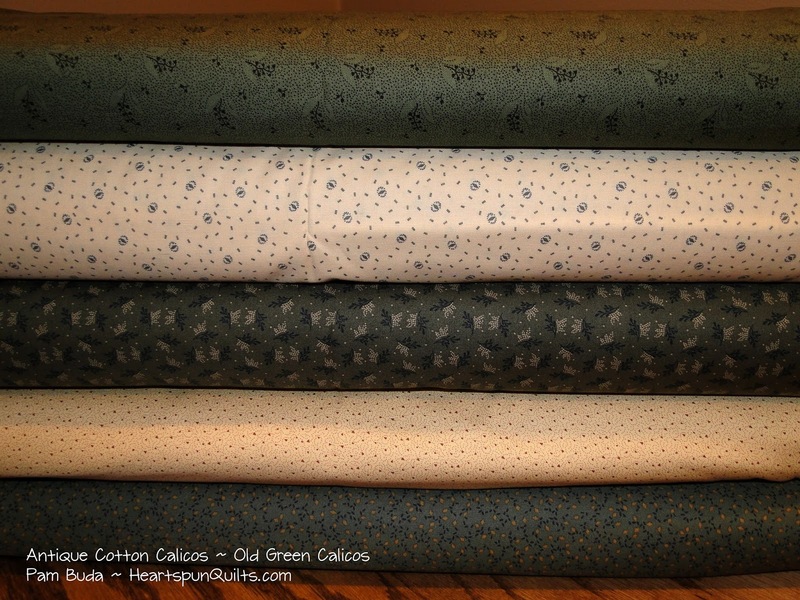 Old Green Calicos will be delivered to your local quilt shop in January! And, yes! There will also be 10 inch precuts of the collection as well. 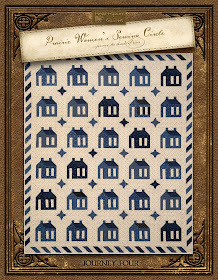 My sample yardage was just delivered, so we've begun to cut the pieces for two quilts showcasing these new prints. I'll be posting pictures of our progress right here, and on Facebook and Instagram! 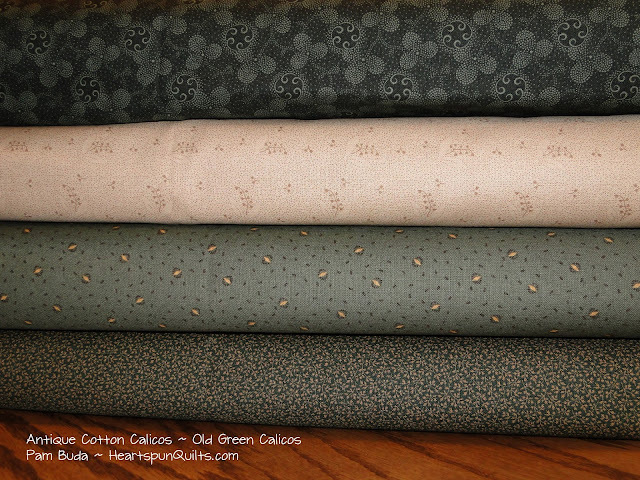 Click here to view the entire Antique Cotton Calicos ~ Old Green Calicos collection. See you back here again on Friday for the third installment of Tucker. Until then, feed your soul with the stitches you sew. So glad you're back to sew along with me once more! I've heard you're a little anxious to get started, so let's do just that. Here we go! Arrange the squares and Half Square Triangles as shown. Sew together into rows. 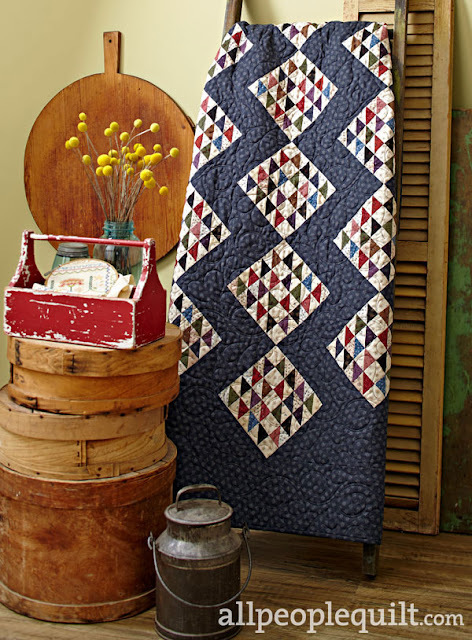 Alternate the pressing direction for each row to create opposing seams. Sew your rows together: press. Your star block should measure 8 1/2" x 8 1/2" unfinished. That's it for now!! Whatcha think?? Hope you like it so far. That's all we have to work on until next week....so be sure to come back and visit again next Friday for the next step!! 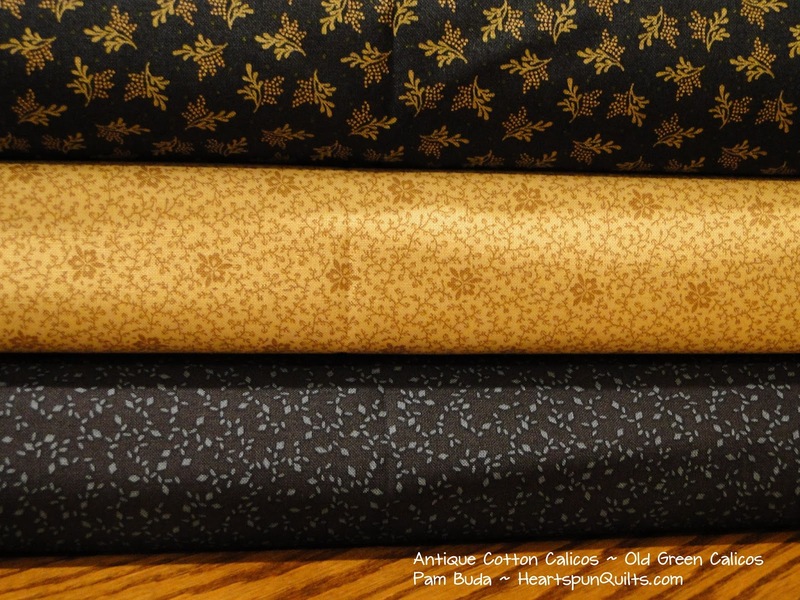 I've had a lot of requests to make Fat Quarter and Fat Eighth bundles of just the eleven assorted shirting light prints from my Antique Cotton collection (Marcus Fabrics) , so that's just what I did!! Stock up on these cuties now! Click here to order and they'll be on their way to your house just in time to add to your Tucker project. And remember...sewing is so good for your soul! Welcome to month Ten....(can you believe it's month ten??!) 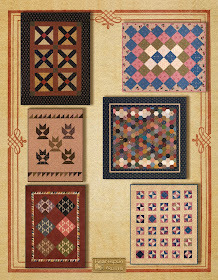 of A Prairie Gathering Quilt of the Quarter. Our quilt sure has grown, and I think we can see the finish line. That always feels so good! Shoo-fly blocks now take center stage. This is just a sweet, simple little block. I'm very fond of them! So, now we're ready to assemble the Shoo-Fly borders and attach them to the quilt. Really jazzed about that! I recommend sewing one Shoo-Fly block to one plain square. This is to control your pieced border assembly and make sure they measure what they should, so no yucky un-sewing is necessary. The combo of one Shoo-Fly and one plain square should measure 4.5 x 8.5 unfinished. You know the drill by now....that if it doesn't, you have only one seam to unsew rather than a bunch that are suspect and you don't know what is what. 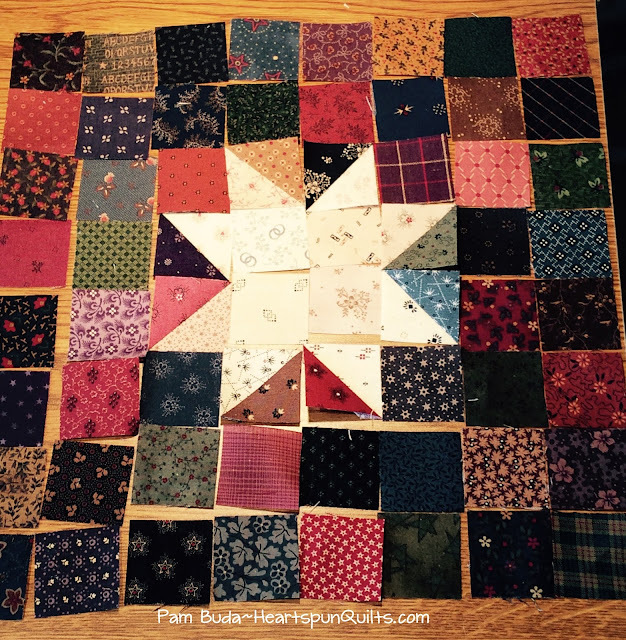 Follow the pattern directions for piecing your Shoo-Fly borders and check those measurements!! Attach to the quilt center, and press. You'll then be attaching another plain border. Looking sssooooo good! From here, you'll be making more HST's and putting them aside for next month's piecing. Fun stuff coming next month!! 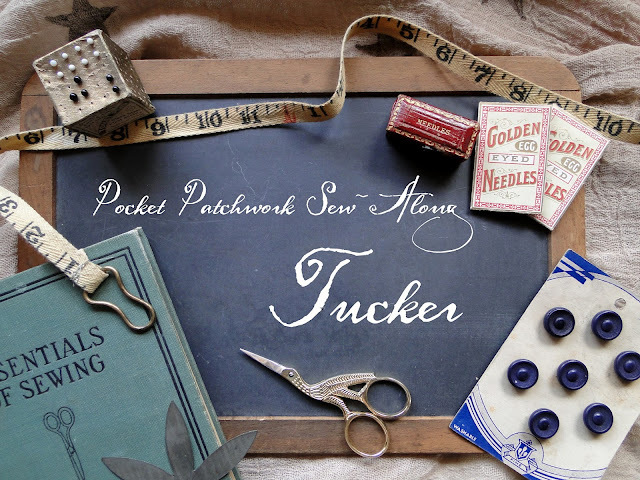 finding out about my FREE sew-along called Tucker, click here to get the scoop! Oh, and I'll be hosting another scrap fabric give-away very soon! Welcome to my Pocket Patchwork Sew~Along, which I'm calling Tucker!! There's a little more to the name than I can tell you right now, but you'll know why I chose Tucker in the "reveal" blog post. Hoping it will make you smile! 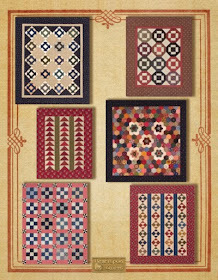 Tucker was inspired by a recent visit and tour of the International Quilt Study Museum located in Lincoln, NE. They obviously have many, many quilts there, and I did appreciate all of the current exhibits, where I saw both very old and recently made quilts. You won't be at all surprised when I say the old ones were of special importance for me. 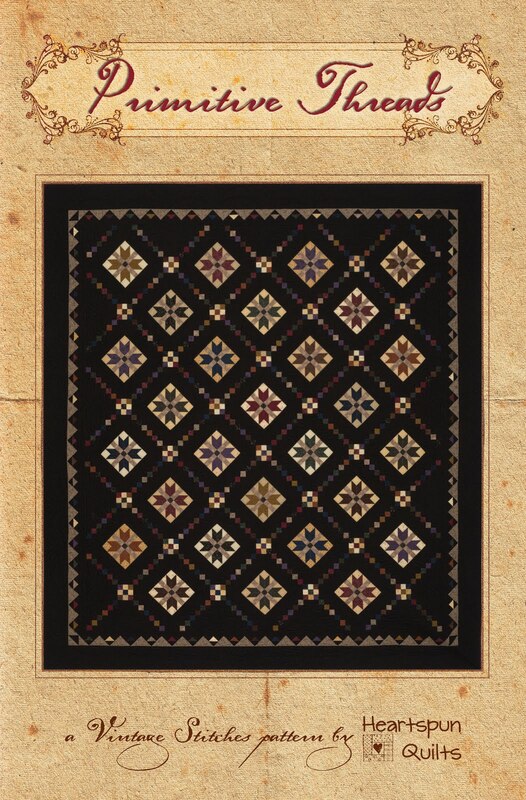 I was most interested in the museum's acquisition of all of Mary Campbell Ghormley vast antique doll quilt collection, as well as the Civil War reproduction quilts made by Mary herself. Mary, you see, had been collecting vintage doll and small quilts long before it was vogue to do so. 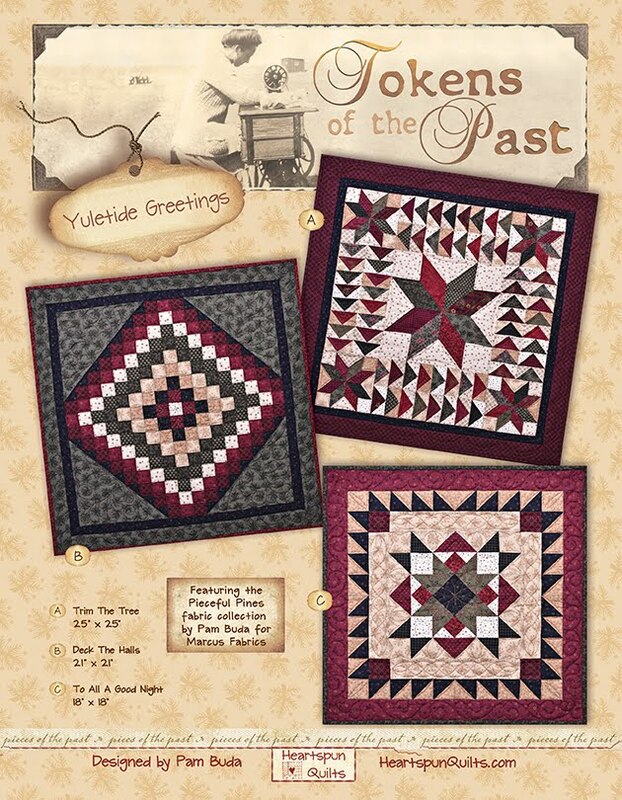 In her book, Childhood Treasures, Mary Kay Waldvogel wrote about Mary and featured 80 of Mary's vintage quilts. A wonderful book, indeed! Mary (whom passed away not long ago) was a big part of the International Quilt Study Museum, and quilting in general in Lincoln. Some of the vintage quilts in her collection are truly stunning pieced works of art, and then there are those that are just sweet, little ordinary patchwork quilts.....tangible patches of nineteenth century living...where each little leftover square was coveted by their maker, and saved to be used somehow, somewhere. And..... that is the place where we will begin. If you choose to sew-along with me, you'll be choosing your own sweet, little patchwork squares to make a little something out of the ordinary! This is not going to be a little quilt you would normally expect from me, but I think you'll be pleased none the less. Our sew-along will only last 4 weeks, and you'll only need to use your scraps. Let's Journey The Threads of Time ™ together!! Here we go! I'm using 1 1/2" x 1 1/2" unfinished squares. Tucker is very flexible, and if that size is too small for your liking, then choose the smallest size you're comfortable working with. (20) assorted light print 1 1/2" squares. (100) assorted dark print 1 1/2" squares. (8) assorted dark print 1 1/2" x 2 1/2" rectangles. And...make (8) Half Square Triangles trimmed to measure 1 1/2" x 1 1/2". I literally used some I had lying around. 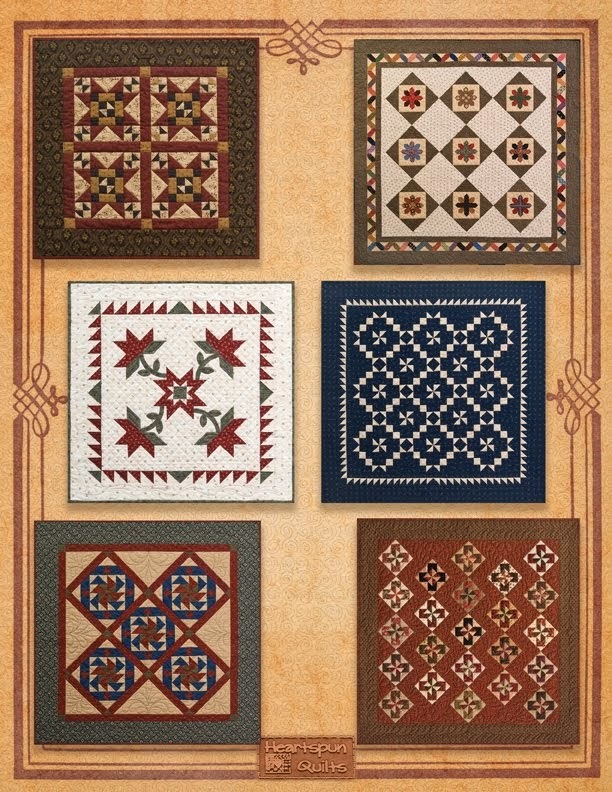 If you need to make some, cut your squares to 1 7/8" x 1 7/8". 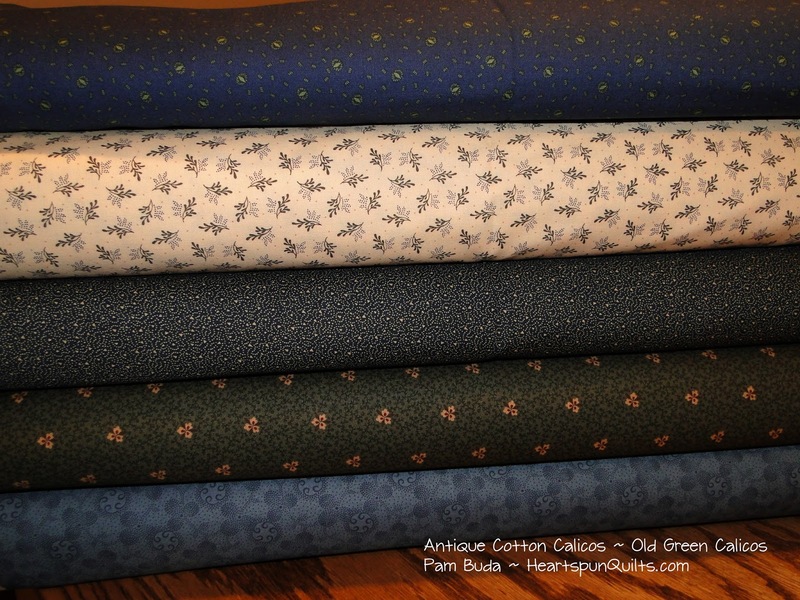 That's your first task...to gather and cut your fabrics, and make or acquire (8) HST's. The next Tucker post will be on Friday, October 23rd so you'll have some time to gather and cut your fabrics. The subsequent posts will be on Fridays, October 30th and November 6th. Have I piqued your interest? Are you jumping in with all of your scraps, or are you pondering what to do? Well....I sure hope you join us!! Oh Lord, I think I'm loosing it. Somehow, I totally missed Karen from Breezy Points' comment where she correctly commented on the number of named patterns in my Give-Away!! OMG...I feel so, so bad. Karen ~ I'm so sorry!! I think I'm having another bout of "some-timers"!! It was so fun to see your lovely home and charming displays. You have some amazing collectibles too! I counted 28 named quilts minus the repeats, but I counted the pin keeps-- hope that's right! I will, of course, honor both Karen's correct answer AND send a duplicate winning package to Margaret as promised. I've already contacted Karen, but Karen, if you read this first, please email me! I don't think my "some-timers" is catchy!! 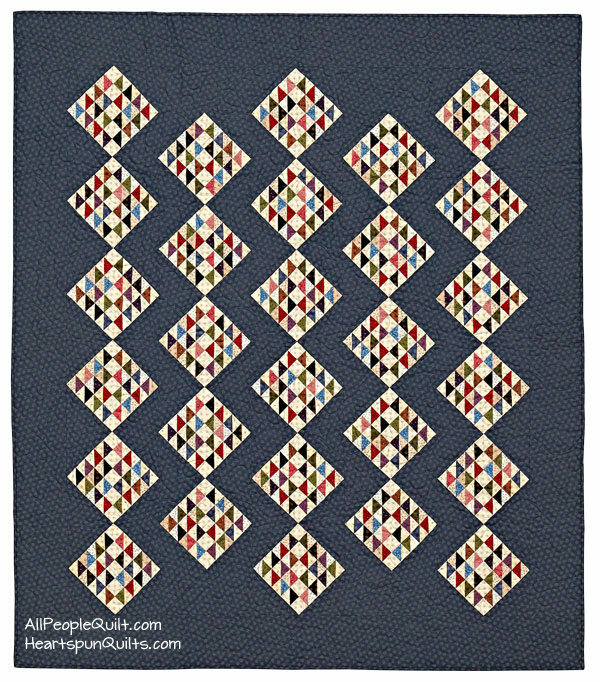 In my last post, I offered a give-away to one winner whom correctly counted the number of named quilts listed in both the American Patchwork & Quilting profile article AND those listed in the on-line link of additional photos provided by the magazine. No one guessed correctly! 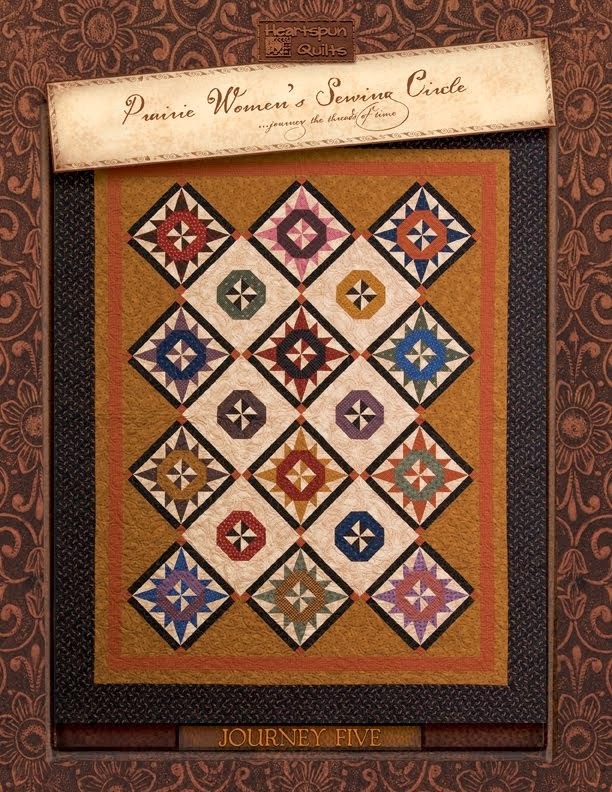 There were 28 different quilts named, with 3 quilts mentioned twice. The APQ article was marvelous, as were the photos of your home. How lovely and inviting it appears! I counted 21 named quilts, (not counting the Prairie at Heart quilt, which I love, love, love. I'm pretty sure that quilt has a future in my sewing room and home. 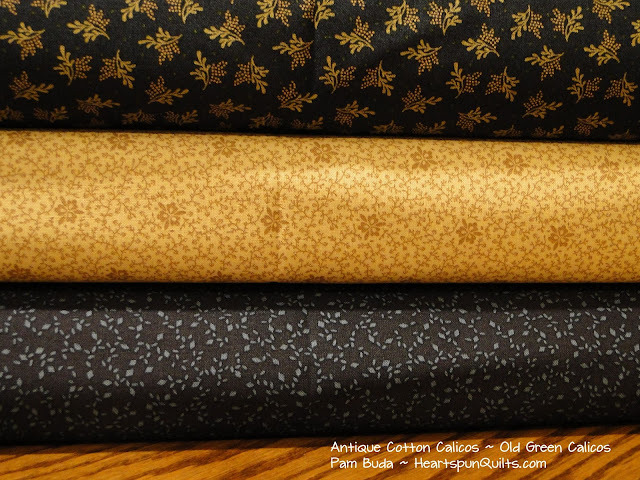 Thanks so much for your generosity in sharing that pattern with APQ). Congratulations, Margaret!!! 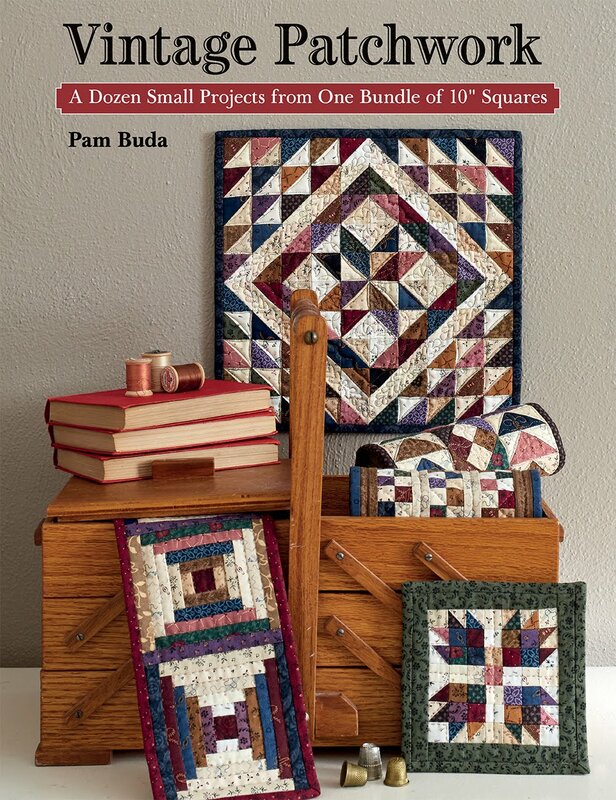 Please email your mailing address to me at Pam@HeartspunQuilts.com, and I'll be sending you all of the patterns containing all 28 quilts!!! Enjoy! Thanks to everyone who took the time to play along with me, and again...I'm completely blown away by the loving outpouring through comments on my blog, and through social media over the magazine article. I'm so appreciative and humbled by your kind words and support!! The words "Thank You" just don't say what I feel for you all. 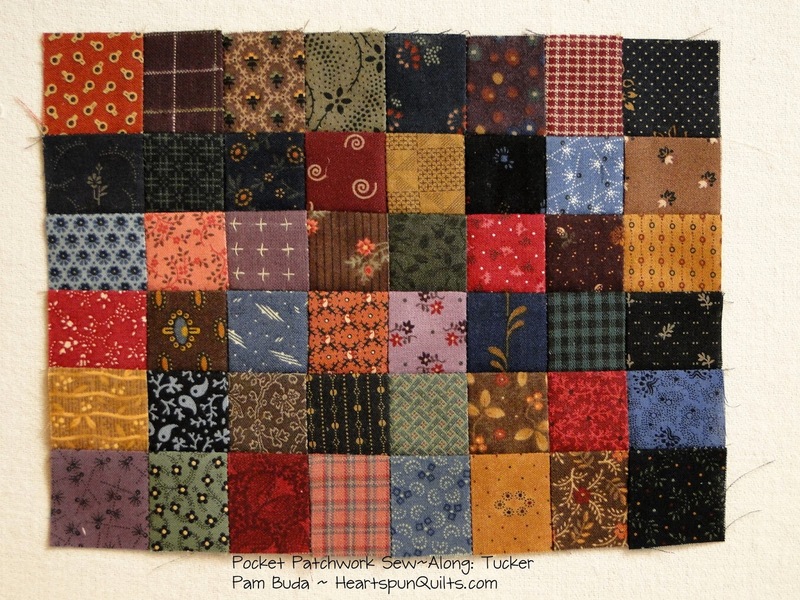 I promised your first post of my new Pocket Patchwork Sew-Along today, and I will be posting all about it in a separate post in just a few hours. Do what makes you happy!! Hope you find time to sew today as sewing is good for your soul! Let's begin today with the hub of every home....the kitchen. My kitchen is decorated in reds, blues, deep gold and black, with a touch of other country colors here and there. This has always been a favorite place for my antiques. The quilt is called Remember Me from Journey Two of the PWSC club, and is a treasured and very special quilt to me because all of the signatures are from the PWSC club founding members and my dearest friends. The founding club members signed up for the club in the early, early stages when no one knew what the club was about, and I was the only one teaching it. They continued on with me through the last Journey! Believe it or not, Remember Me hangs from a vintage donkey yoke. I had no idea what it was when I spotted it at the antique show, I just thought it would be fun to hang a quilt from it. The vendor told me what it was, which made it all the more fun! I'm a sucker for vintage crates and wood boxes with original advertising still in tact. You will see a beautiful picture of this vignette in the American Patchwork & Quilting on-line link listed in the magazine (which shows more pictures of my home you won't see anywhere else.) They make for really cool storage as well. 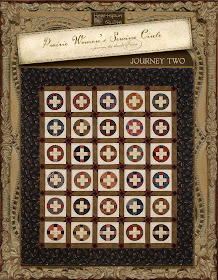 The quilt atop the wood crate is Four Around Nine from my Tokens of the Past: Nine Patch Reverie pattern. I stitched this wool sampler for the kitchen and love the colors and texture of the wool. Now, who doesn't love wool?! 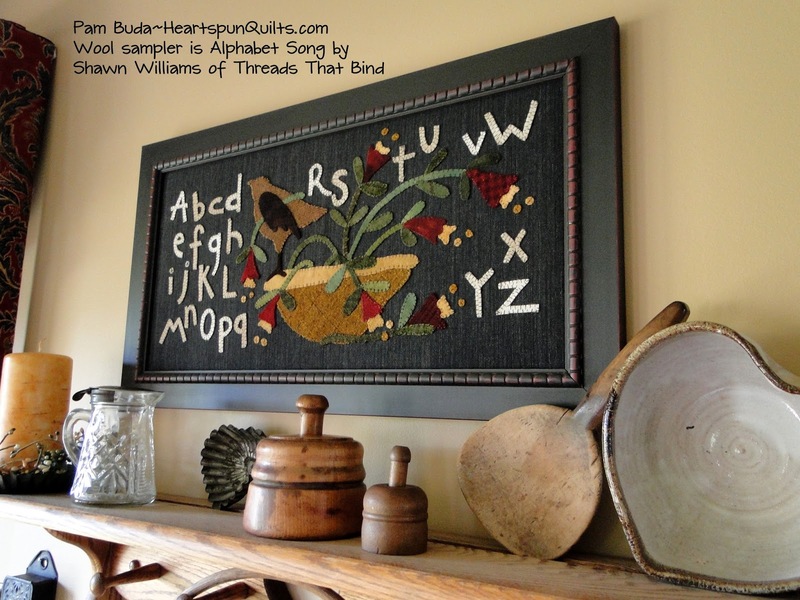 The sampler is called Alphabet Song and was designed by Shawn Williams for Threads That Bind. I love her work. Spongeware and other pottery are another favorite collectible. You'll find nothing true white in my house, as I maintain nothing stayed white on the Prairie! 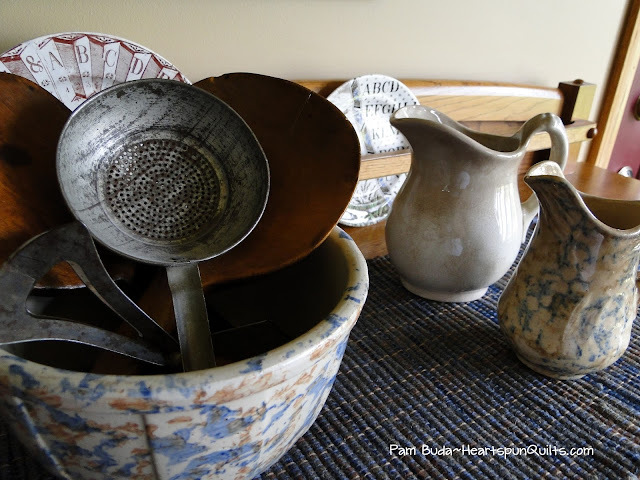 The granite-ware berry pot and jug were gifts from my dad and step-mom as they are great antiquers as well. The yellow-ware bowl sits atop a scrappy thimble quilt. The more fabrics the better!! Our dining room is anything but formal as we're just not the "formal" type. Family meals in the dining room are casual, even when dressed-up for the holidays or special occasions. 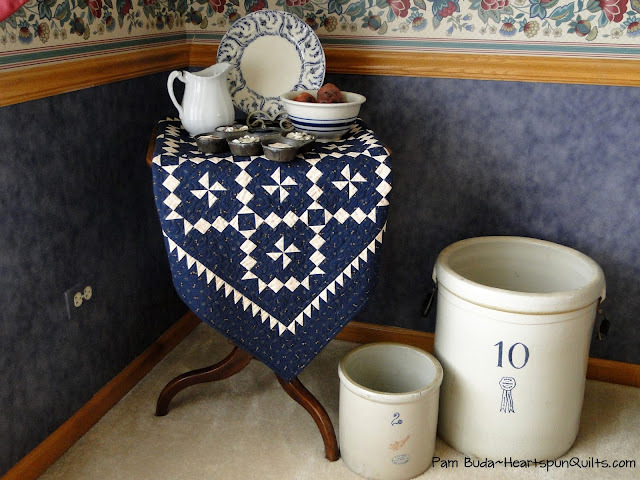 The quilt draped over the vintage side table is called Something Blue from PWSC club-Journey Five. It's bigger sister is Settler's Puzzle, shown on page 17 in the magazine. One of my big philosophies is to bring out works-in-progress to enjoy what you've done thus far. 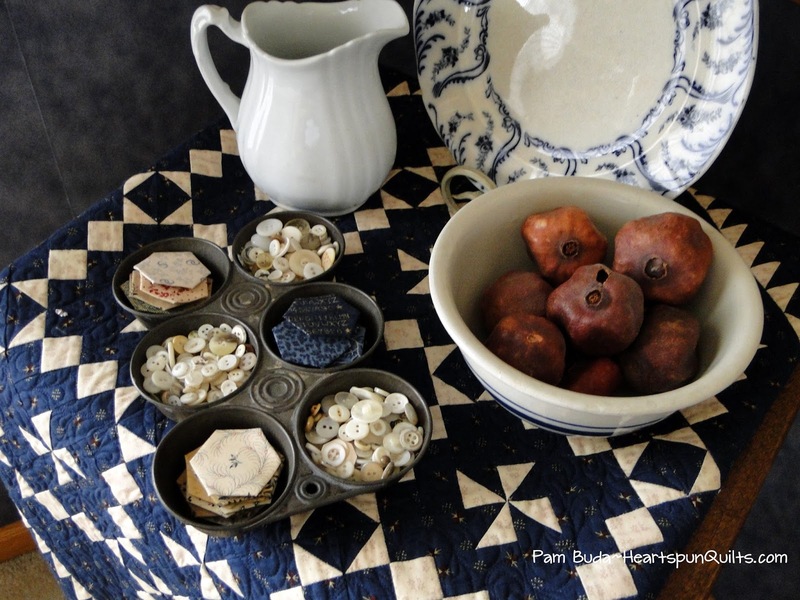 Display them in glass jars or pretty bowls, or as I've done here, in a vintage muffin tin with old ivory buttons. You'll see other examples of displaying works-in-progress in the magazine article as well. I like to look at antiques not only for their obvious appeal, but for how I might to use them to display the many quilts I'm making. This old merchants biscuit display with the glass front is just perfect for stacking little quilts inside. 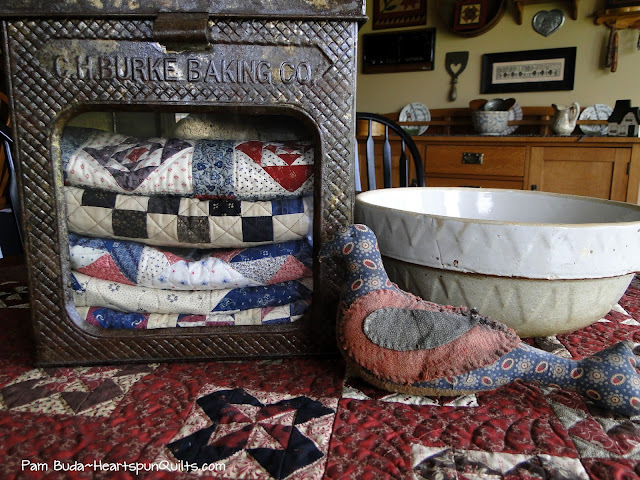 The quilts in the tin are all from various Journey's of the PWSC club, and the quilt on the table is Emma's Sewing Basket from PWSC-Journey Five. Sewing needfuls decorate the vintage spool cabinet that is put to use daily. The tiny sampler you see in the frame is stitched on silk over one thread, at 40 stitches to the inch, and was stitched in 2002 when my eyes were younger! To do another, I'd definitely need a magnifying glass!! As far as sewing rooms go, mine is not terribly large at 15 x 16. Don't get me wrong...I'm very grateful to have a dedicated sewing room, but being that the room is this small, I need to make use of every inch of space I have. 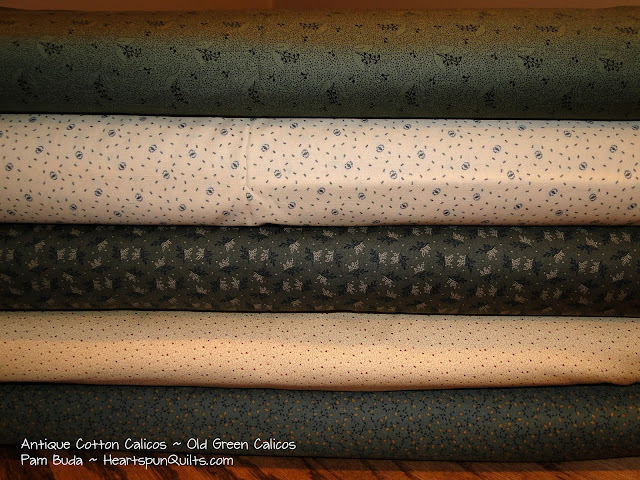 (I do have more space for fabric and Heartspun Quilts inventory and the like in rooms in our finished basement.) I asked one of my brothers to make custom shelves for me which we hung near the ceiling. This frees up floor space, and makes use of never-used space high on the walls. 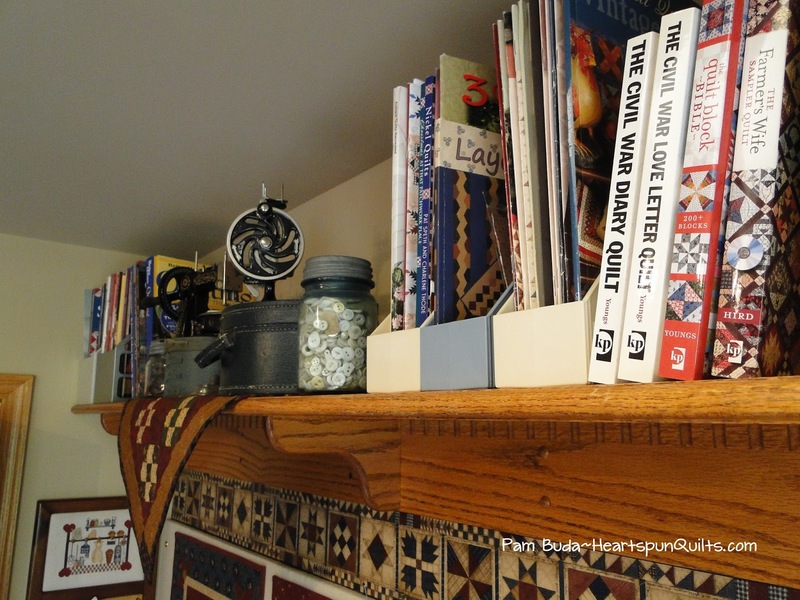 He made them deep enough to hold books and binders, and I can display my vintage toy sewing machines up there as well. I think it really looks nice, too. I found a cute old foot stool, and had a new, custom design hooked rug made to cover the top so I can stand on it when I want a book from the shelves. 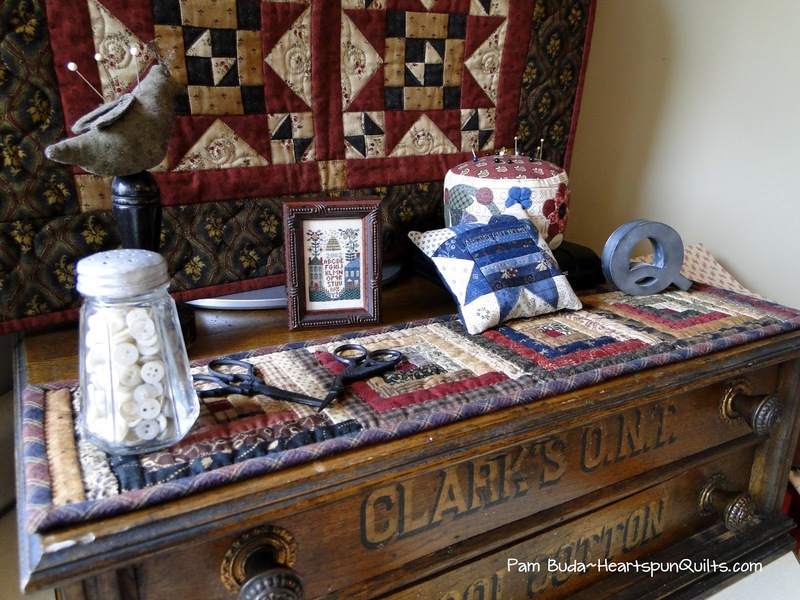 You will see even more photos of my sewing room in the magazine, and through the magazine's on-line link! 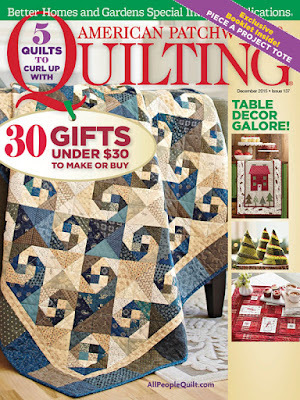 Do you have your copy of American Patchwork & Quilting magazine's December issue?? 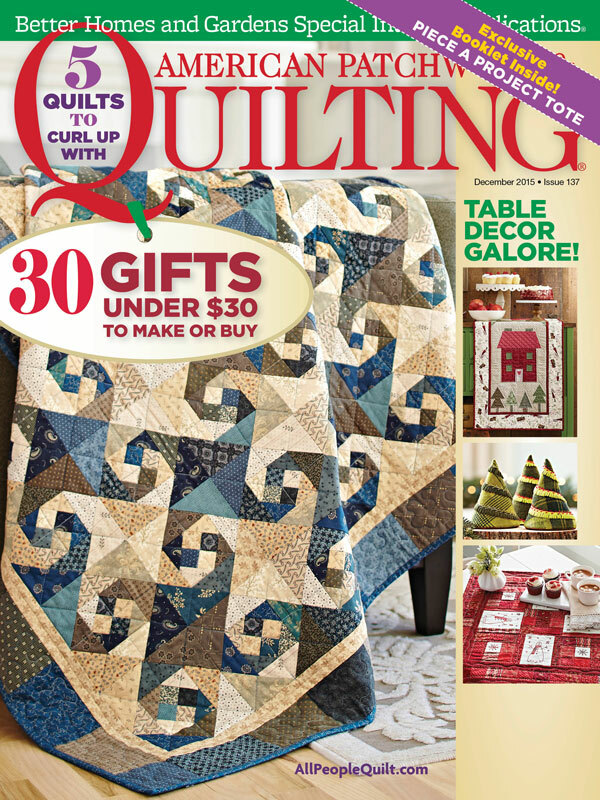 There's a whole lot of great quilts and Christmas projects in there, so don't miss it! 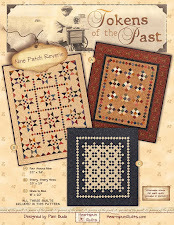 Used with permission from American Patchwork & Quilting magazine. (c) 2015 Meredith Corp. All rights reserved. 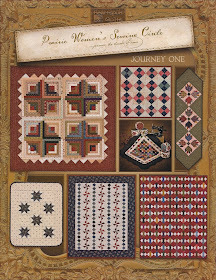 Don't forget to order your Prairie At Heart quilt kit. 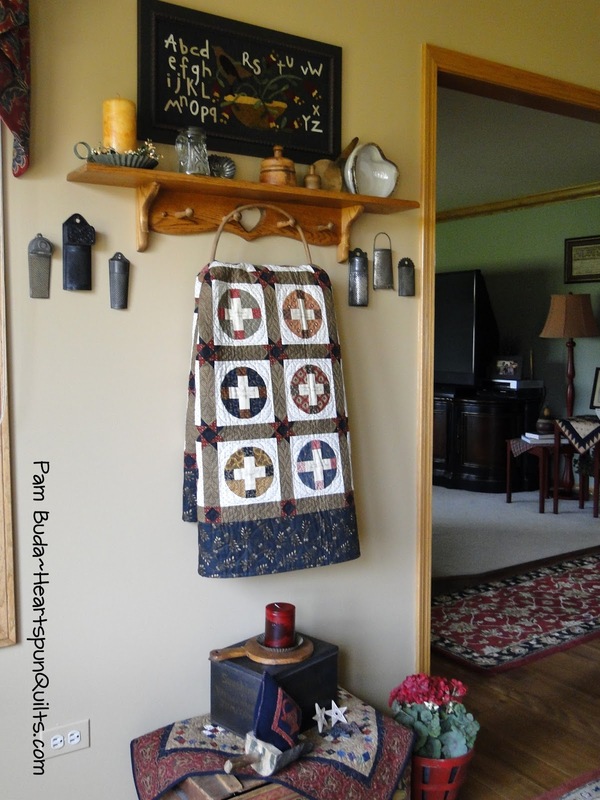 It will add a little vintage Prairie charm to any room you'd like! Thank you for taking this little tour of my home with me. I hope you see a few things that may inspire you. And, I also want to thank you all for your well wishes and congratulations. It has touched me deeply and has filled my heart with joy. You're kindness is appreciated more than you'll ever know!! In a previous post, I promised a give-away, so here it is! 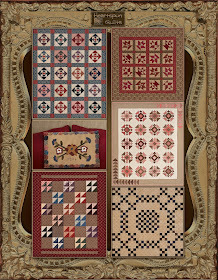 Count the number of the named quilts in my patterns, seen in the photos of the profile article, AND in the photos of my home through the on-line link provided for you in the magazine. Leave your comment for me to this blog post, and one lucky winner will receive ALL of the patterns named in the magazine, and on-line!! Post your comment with the number you choose by midnight, Sunday, October 11th. I will reveal the winner on Monday, October 12th. Please include your email address in your comment. Pocket Patchwork Sew-Along called... Tucker! 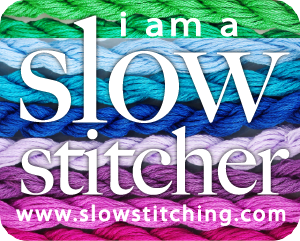 The best way to participate in the FREE sew-along is to subscribe to my blog posts. That way, you will receive the posts via email, and you can easily print the sewing directions. To subscribe, type your email into the "Follow By Email" icon on the right-hand sidebar of my blog. Follow the directions given to confirm your subscription. That's it!! For me, it isn't everyday that my home is photographed for a magazine. How about never until now! My family and I were flattered (to say the least!) and excited just to see how all of this would work. Fascinating stuff, and a very fun way to spend four days!! Quilt on table is Elizabeth's Prairie Garden~PWSC Journey Three displayed on top of a coverlet. We were visited by Senior Editor, Elizabeth Beese and Design Director, Nancy Wiles, along with photographer Greg Scheidemann, and his assistant (and lovely wife). This photo shows Nancy fluffing my American Gothic quilt to stylize it for Greg to shoot the quilt and all the samplers that are hanging on the wall you can't see (photo on pg 19 in the magazine). 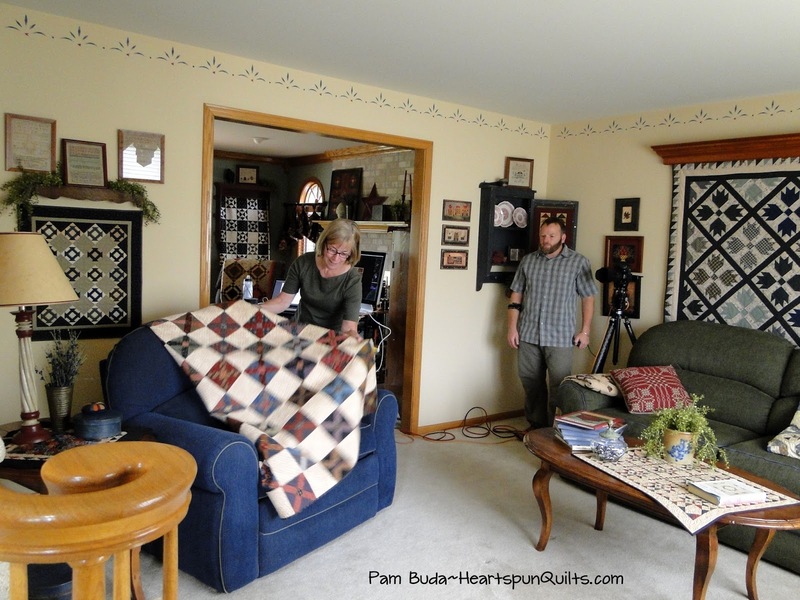 The Bear Paw quilt on the wall behind the sofa was my first quilt acquisition. I purchased the top from a fellow teacher at a quilt shop where we both worked long before I knew how to quilt. I love it so much, I decorated the entire living room around that quilt. Blues and greens are a favorite color combo for me. 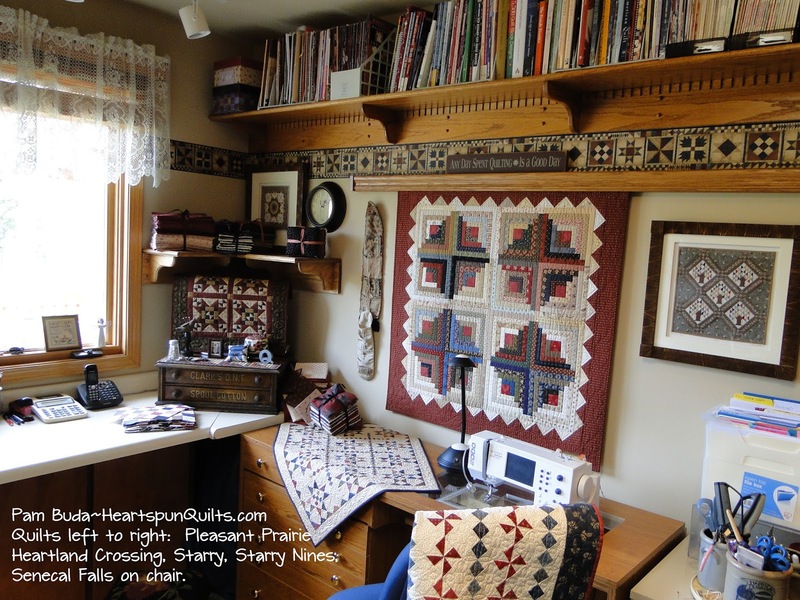 The quilt on the wall behind the blue chair is called A Light In The Window from my Prairie Women's Sewing Circle club ~ Journey Three. This is how the Three Sisters are displayed in my home. One rests a top a vintage sewing machine drawer that my pal Lynne Hagmeier gifted to me. I've turned the drawer into a narrow shelf, and think they all make a good nineteenth century vignette. Here's how it all looks on any given day. The quilt draped over the blue chair is Union Blues, and the other is a quilt I made long ago for my family to use, and for which there isn't a pattern. You might spot our little Yorkie, Bella, in one of her favorite spots in the house, with her head in between the stair rails. I love old samplers as much as I love quilts. I own three with dates in the 1700's, and the rest, nearly thirty more, are all dated in the 1800's. 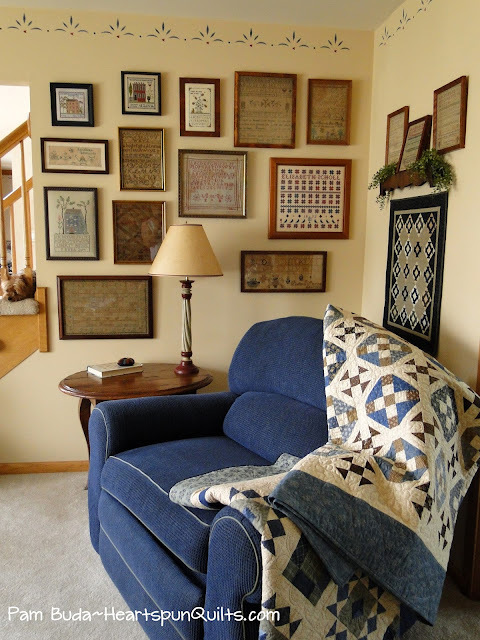 I have some reproduction samplers mixed in with the vintage samplers on the wall in this room, and repros and vintage samplers are displayed all over the house. 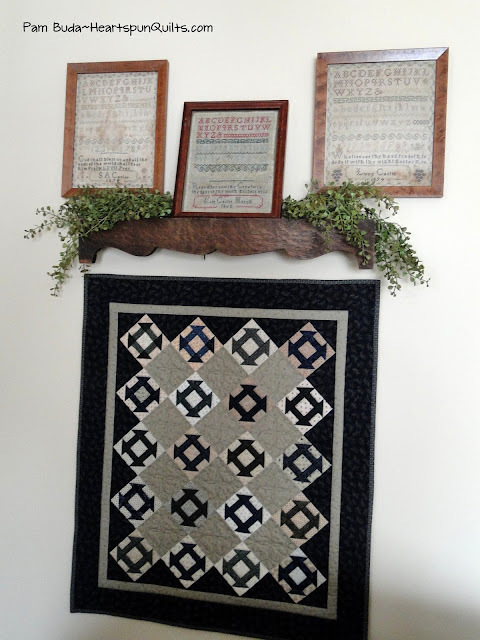 Also displayed in the living room is one of my all time favorite quilts, Scraps From Home, from PWSC-Journey One. 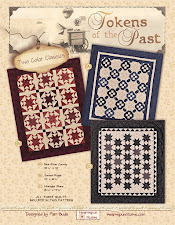 Love the combo of round yo-yos, and straight lines of the Flying Geese, finished with a soft scalloped border. 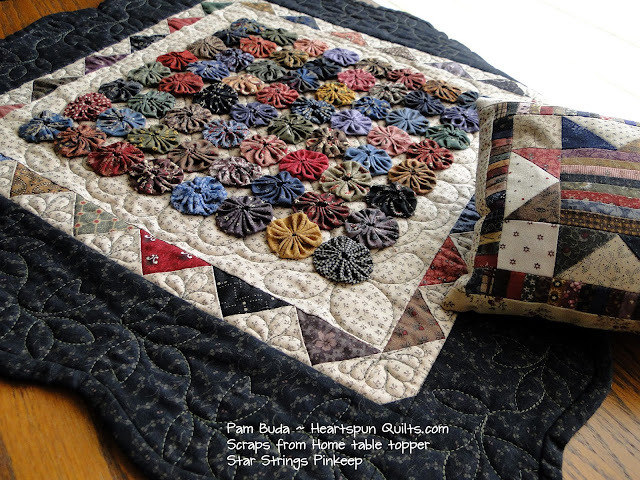 Also pictured is the Star Strings Pinkeep, which has a quilt included in the same pattern. Both are terrific scrap-buster projects!! 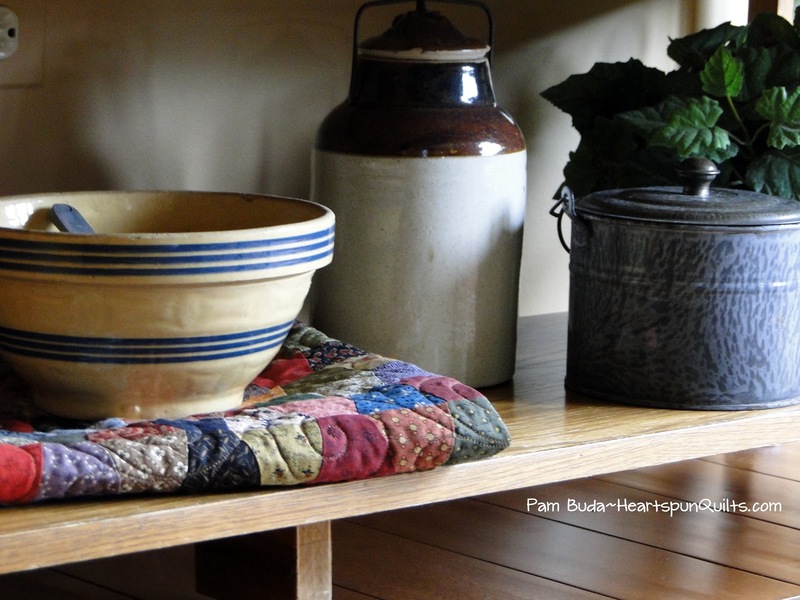 In a vintage treen square wood bucket sits a few things that make me smile. 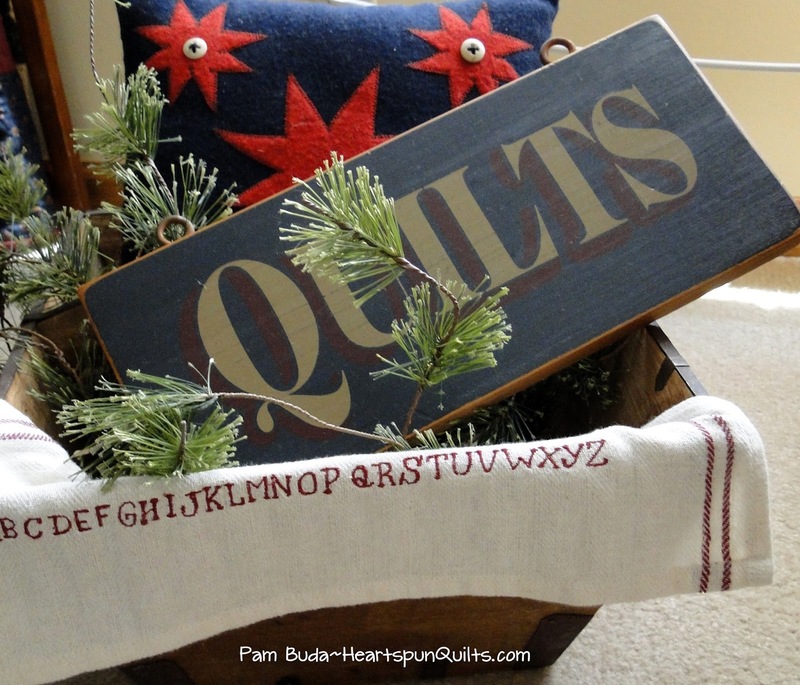 A star block wool pillow, a QUILT sign, and a tea towel with the sampler alphabet. I collect lots of things with the alphabet on them! The items in this bucket are changed out with the seasons and holidays. These little vignettes make me happy, and provide a place to display lots of favorite things. I'm sure you have those favorite spots, too! Well, that's all for now. I don't want to bore you to death! I'll post more pictures of my home and sewing room in my next post. Until then....hope you find some time for stitching and other delights that feed your soul. Can't Believe It's Me in AP&Q Magazine!!! Journey One of The Prairie Women's Sewing Circle club. 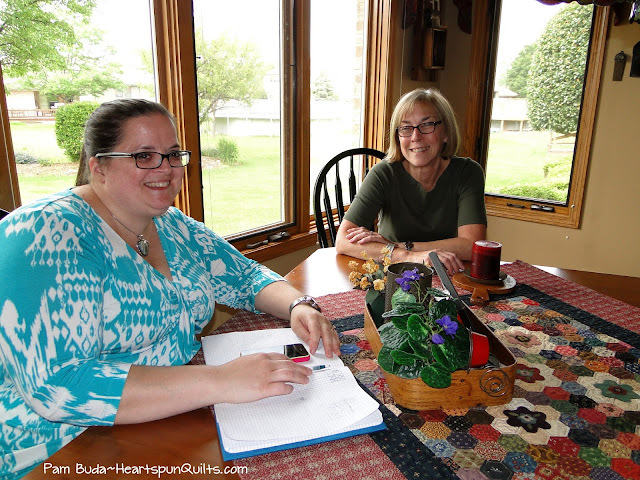 I am still in disbelief over having been chosen to be featured in a profile article in American Patchwork & Quilting magazine!! But here it is...it's finally out, and I am humbled and grateful for this wonderful adventure! 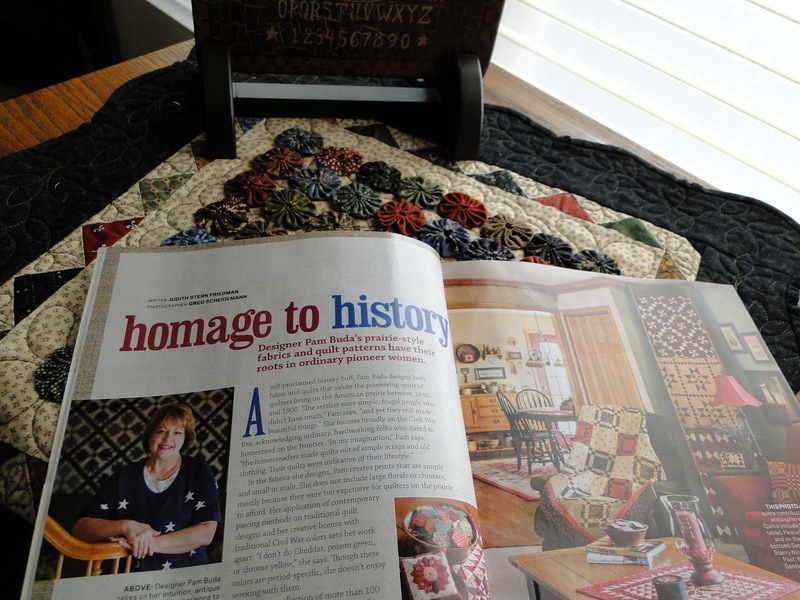 My profile article appears in the December, 2015 issue which is arriving now in your mail box, your local quilt shop, and newsstands everywhere. Several members of the American Patchwork & Quilting magazine staff came to visit us the week following the July 4th holiday, and did we ever have fun! 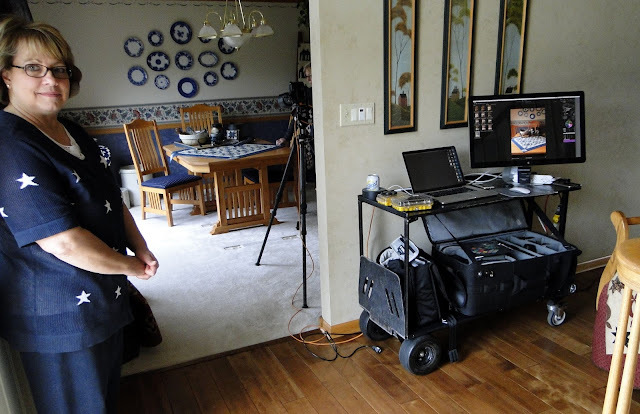 Oh...just a little stress when a national magazine comes to photograph your home!! But, they took all the worries away, and we all enjoyed every moment. I was also blessed to design a special quilt just for this issue, and it's called Prairie At Heart. The name says it all for me, and you can read lots more about what inspires me, and see lots of pictures of my home and sewing room. 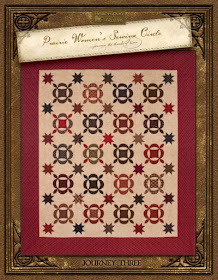 Photo used with permission from American Patchwork & Quilting magazine. 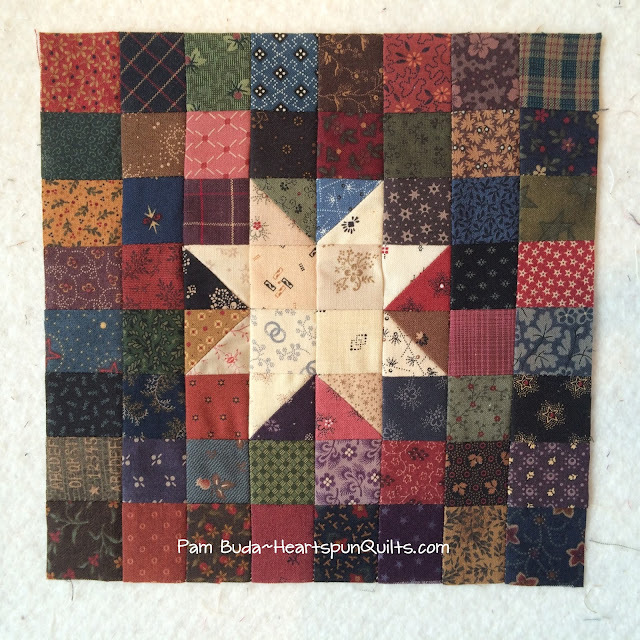 Prairie At Heart was inspired by an amazing nineteenth century antique quilt that just caught my eye for it's powerful pizzazz, and patchwork simplicity. One glorious, yet easy-to-piece block, with loads of shirtings and dark prints, set on diagonal point against a sweet navy blue print fabric, just really jazzed me!! I hope you love it, too!! 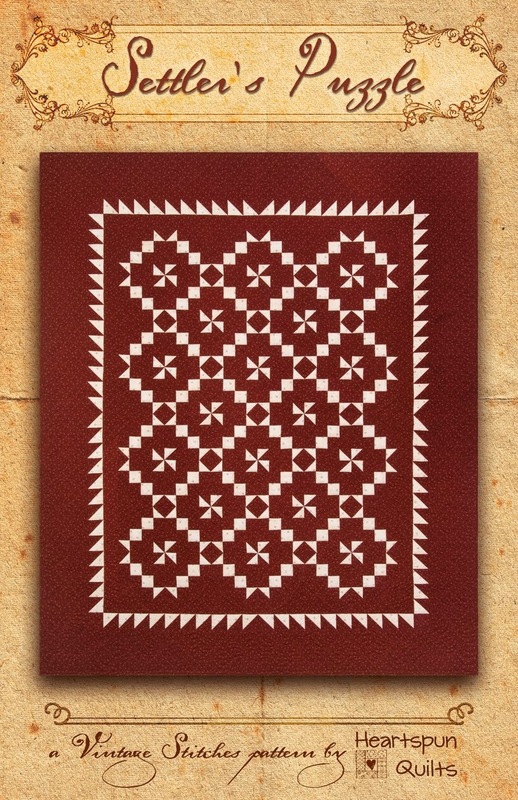 The pattern for Prairie At Heart is, of course, found in the pages of this, the December, 2015 issue. Also in this issue is a web link to see even more photos of my home! all from my Antique Cotton fabric collection for Marcus Fabrics. Click here to order a kit, and bring a little Prairie into your home. 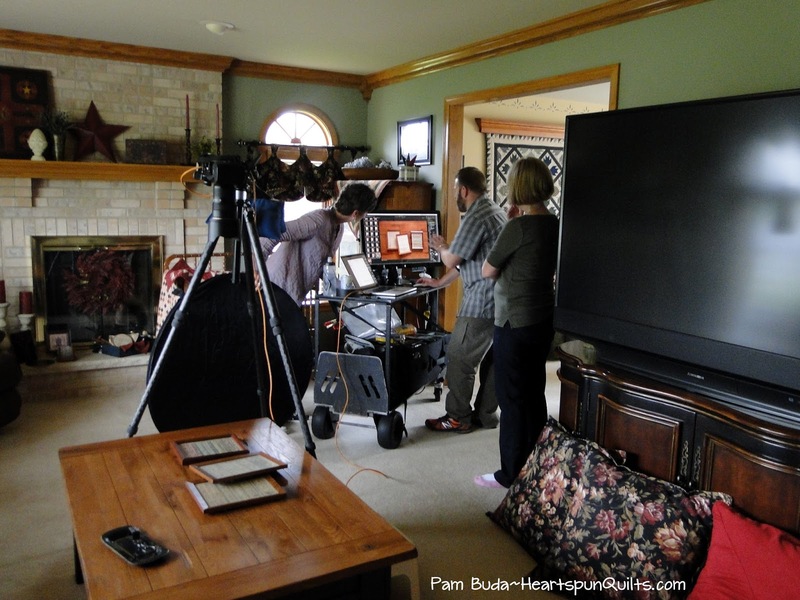 I'll share more photos of my home, and some behind-the-scenes pictures of the photo shoot in my next blog post!! 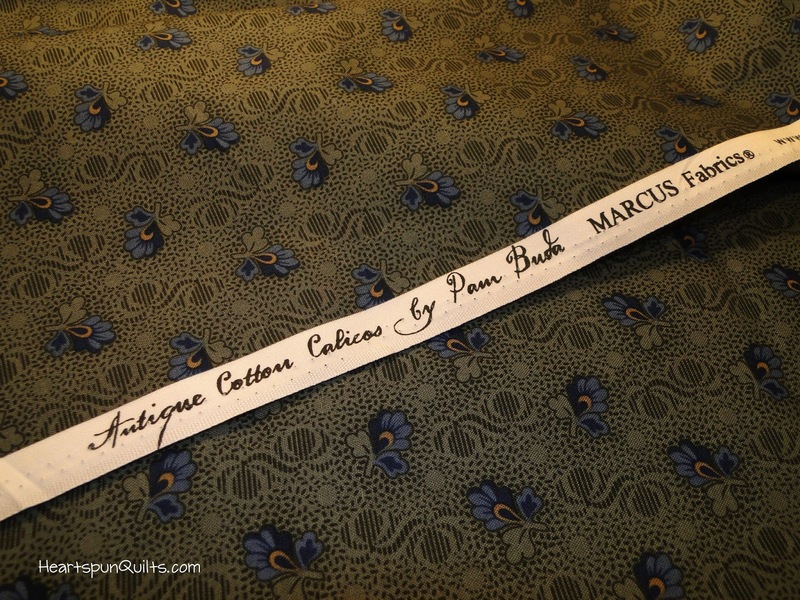 I also invite you to click on over to the Marcus Fabrics blog, where you'll see a few pictures you won't see here. And...I'll have a BIG GIVE-AWAY next week, so watch my blog for news!! So exciting!! Sending out the biggest THANK YOU to all the amazing and oh-so-talented women working at American Patchwork & Quilting magazine. You're a joy to work with each and every time I am lucky enough to do so!!! Find some time for the stitching that feeds your soul!